The HG1500 was designed to be the most convenient generator possible in a small package. Two standard outlets and a DC outlet are both protected with rubber covers against moisture and dirt. Power your next special event, tailgating, camping expedition, recreational vehicle, or outdoor adventure. With over 600 registered service centres across North America to choose from and an extended 3-year warranty you can rely on your Hyundai generator for the long haul. 12V DC outlet and included charging cable can charge your car or other large batteries. Metal frame is made from 22mm tubing, a thicker diameter for this size of frame than the industry standard. Rubber covers on every outlet makes sure moisture and dirt wont damage your electronics. The engine is protected with an automatic low-oil shut off function, triggered if the engine oil falls below a safe level. All-metal fuel tank is much more resiliant to wear and tear than plastic tanks. 98cc OHV engine with AVR produces 1,400 watts of running power and a maximum of 1,750 watts. Every Hyundai Power product is covered by a Limited Warranty, providing parts and labour for the first year and parts for the second and third year. 1700 Running Watts, 2200 Starting Watts. Computer-Controlled Inverter Technology automatically adjusts engine speed to run quieter and reduce fuel consumption. (59dB) Less than 3% Harmonic Distortion, safe for sensitive electronics. Convenient Control Panel. The Briggs & Stratton 30545 PowerSmart Series Portable 3000W Inverter Generator is perfect for your camping needs and produces clean and instant power to keep appliances and other important electronics powered during trips in your RV. The 30545's engine speed adjusts automatically, further reducing noise, fuel consumption, and emissions. If you don't think that's enough power, it also has parallel capability so you can connect two units together for more power. The two handle design with luggage style telescoping handle and never go flat wheels make it easy to transport and it produces smoother power for sensitive electronics. Equipped with (4) household outlets (1) 12V 30-amp locking outlet with RV adaptor DC charging outlet and a USB port, you can charge almost anything with this inverter. The easy-to-read LCD screen shows the amount of power being used, total unit hours, and maintenance reminders, including oil, air filter, and spark plug changes. Other features include PowerSmart mode to automatically adjust engine speed to save fuel and run longer. The Briggs & Stratton 30545 PowerSmart Series Portable 3000W Inverter Generator comes with a 2-year limited warranty to protect against defects in materials and workmanship. Briggs & Stratton products are designed, manufactured, marketed and serviced in over 100 countries on all seven continents. The Energizer eZV2000P is a fuel-efficient, portable inverter generator powered by an ultra-quiet engine and class-leading inverter technology. With a continuous 1,600 watts of clean electricity you can quietly power common and sensitive electronics during camping trips, tailgating, hunting, traveling, and jobs around the house or workplace. A newly designed single-outlet parallel port makes connecting two eZV-series generators easy, allowing you to combine the output of two generators to power your RV, trailer, or your home in an emergency. At only 50-59 decibels the eZV2000P is so quiet you'll have to hear it to believe it. The Energizer eZV3200P is a fuel-efficient, portable inverter generator powered by an ultra-quiet engine and class-leading inverter technology. It includes premium features such as remote and electric start, a digital multi-function display, automatic throttle, automatic choke, integrated folding handle and wheel kit, threadless metal fuel cap, and covered outlets. Producing a continuous 2,800 watts of clean electricity at 3600rpm, the eZV3200P quietly powers common and sensitive electronics during camping trips, tailgating, hunting, traveling, and jobs around the house or workplace. The integrated twist lock outputs 120V at 23.3A, perfect for powering RVs, trailers, and your home in an emergency. A newly designed single-outlet parallel port makes connecting two eZV-series generators easy, allowing you to combine the power of two generators into a single output. At only 52-60 decibels the eZV3200P is so quiet you'll have to hear it to believe it. 1,750W Gas-Powered Portable Generator The HG1500 was designed to be the most convenient generator possible in a small package. Two standard outlets and a DC outlet are both protected with rubber covers against moisture and dirt. Power your next special event, tailgating, camping expedition, recreational vehicle, or outdoor adventure. With over 600 registered service centres across North America to choose from and an extended 3-year warranty you can rely on your Hyundai generator for the long haul. 1,750W Gas-Powered Portable Generator is rated 4.5 out of 5 by 2. Rated 4 out of 5 by Bushead from Nice little gen I bought it about 6 weeks ago and so far it has worked great. Bought it to use while camping. It’s not as loud as older gens, it’s fairly lightweight and compact as well. Great little unit for its price. I only gave it 4 stars because I never give 5... there’s always something any product could improve on. Rated 5 out of 5 by EV 58 from Great value for money Great purchase. I bought the Hyundai generator as alternate power source while the cottage was under renovations and electrical upgrade. Easy to start and use. I love it! Just received my Hyundai hg 1500 generator and there are no battery charging cables included . What gives ? 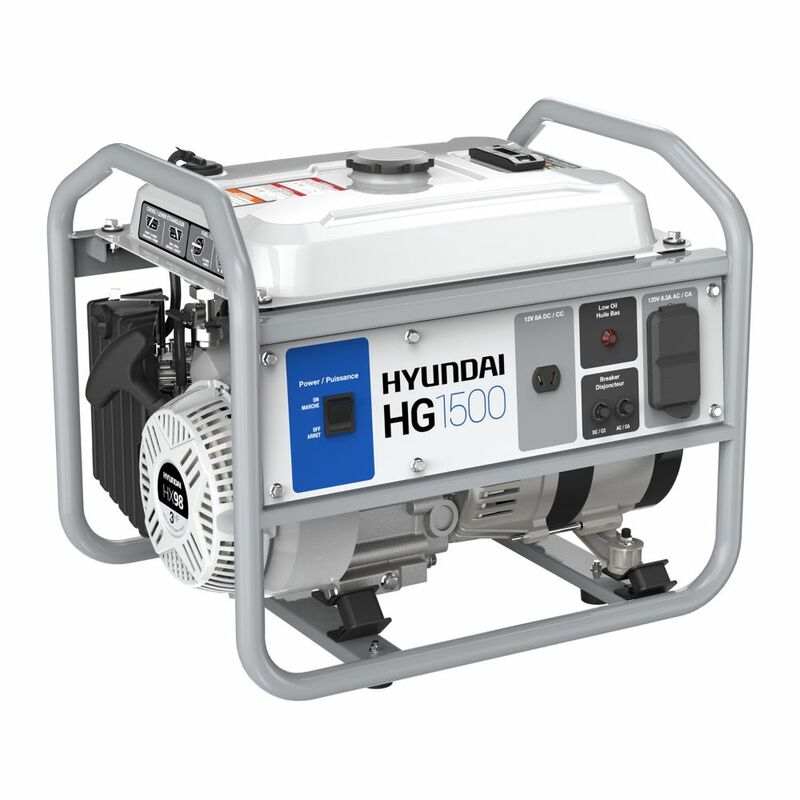 Can I charge deep cycle batteries with Hyundai hg 1500 generator ?